Everyone knows or has heard about the three R's. But what do they really mean?? When we talk about the waste we generate and how it's managed, these terms are listed in order of priority. Let's take a look at each term individually. 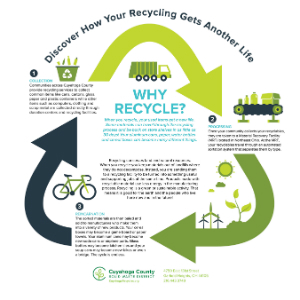 Looking for details about curbside recycling in Cuyahoga County? Most communities will pick up mixed recycling at the curb. Find details for your community. Don't make trash in the first place. Reduction is priority #1. Use less stuff, decrease your consumption and minimize your waste footprint. Ultimately, garbage is buried in a landfill and never used again. Reducing requires people to think about how to prevent trash and household waste from going into the garbage can. Do not purchase or use disposable items such as paper products, straws and single serving containers. Pack lunch or a snack that does not involve throwing anything away when you are done. Make sure to include a cloth napkin. Avoid buying cleaning and other products that contain hazardous substances. On average, a household contains about 100 pounds of toxic and/or hazardous materials. 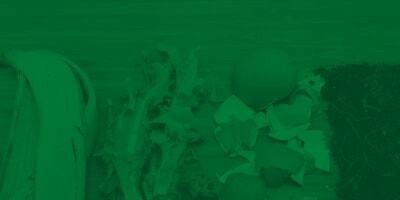 Compost yard and food waste to decrease your trash and prevent the loss of nutrients. Common materials are used again for the same purpose or for something different. If you can't reduce, then consider reuse. Clothing is reused because it is expensive and unpractical to buy new clothing every day. By taking care of the items and/or doing routine maintenance on goods, they can be used longer. Reuse activities can take skills such as fixing a broken game or sewing a torn shirt. Or you can turn that old pair of jeans into a new purse. Repairing broken items saves money by making the purchase last longer. It also creates less trash. Also, reuse can require a touch of creativity to craft a treasure box from a carton, a bracelet from a toothbrush, a greeting card from an old CD case or a new piece of furniture out of salvaged wood. Help others by reusing unwanted items through donations to churches or non-profit organizations or freecycle them. Find local organizations that accept unwanted items. Collecting, processing and selling products made from old materials. If you can not (or have not) reduced or reused first, then consider whether your item can be recycled. 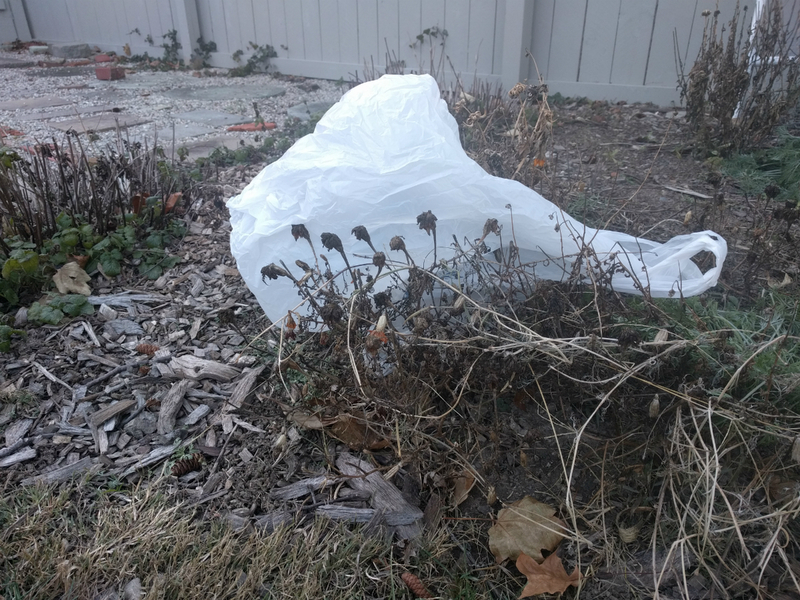 In Cuyahoga County, certain items can be recycled curbside and others need to be dropped off at retail stores, city service departments or other business locations. A recycled plastic soda bottle is chipped, melted and made into fiber, which becomes a jacket or sleeping bag stuffing. The old material in a new product is called recycled content. Some products are made with 100% recycled content such as a cereal box made only from recycled paper. An aluminum can might only be made from 40% recycled content because the can must be made from some bauxite (its natural resource) to keep it strong. Most communities in Cuyahoga County will pick up mixed recycling at the curb. Find details for your community. If a community does not have a curbside program, there may be city drop-off bins available for residents. Some local businesses, schools and nonprofits host drop-off recycling containers for paper or other items.